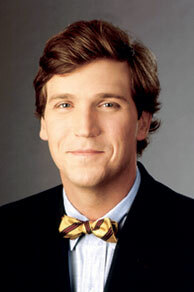 Bow tie wearing Bill O'Reilly want-a-be Tucker Carlson got our attention when he was talking about Senator Barack Obama and said that he should discuss "important issues instead of black issues." Of course our boy O'Reilly would never say anything that stupid. Well Tucker was just moved out of his prime nighttime slot at 11 p.m. to the netherworld at 4 p.m. He'll be gone real soon. MSNBC is the lowest rated of the cable news and talk shows. We actually thought John McEnroe and Dennis Miller over on CNBC were much better than TC.. Maybe they should consider giving us a try. We couldn't be any worse than TC.